Free download Toolwiz Time Freeze latest version. Toolwiz Time Freeze is a must have for anyone who doesn’t want to make any unwanted changes to the system. No matter what changes are made, no matter what happens, a simple restart will return things to the way they were. Nothing bad can happen to your PC while Toolwiz Time Freeze is up and running. Modifications made to the settings will be undone, files downloaded from the web will be removed, and other unwanted changes will all be undone when you restart your PC. It puts everything on ice so that no unwanted changes can be performed on your PC. You can enter the freeze mode with a simple click and quit the freeze mode with a simple restart or shut down. Implement of Virtualization: Create a virtual environment as a copy of the real system where allows an unmodified operating system with all of its installed software to run, keeping your actual system ‘frozen’ and away from unwanted changes and malicious threats. 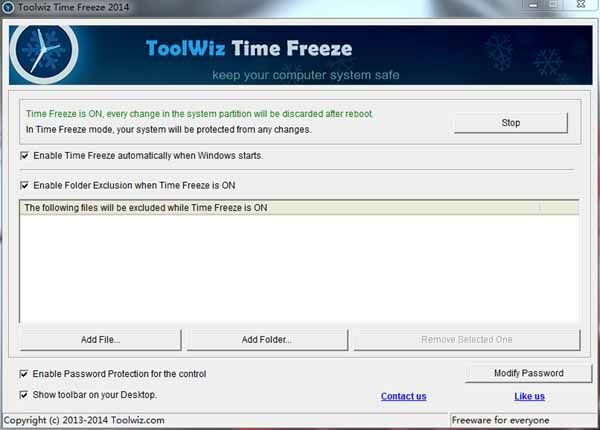 Nothing bad can happen to your PC while Toolwiz Time Freeze is up and running. Operating System Support: Run multiple operation systems (real&virtual systems) at the same time on the same PC without reboot and easily switch between them to optimize your PC resources and improve efficiency. Infrastructure Consolidation: Consolidate the management and utilization of your system’s resources to help you build a more flexible and responsive IT infrastructure.